Pontoon is very similar to blackjack, but the terminology is different. Here is a quick summary of some Pontoon terms, and their blackjack equivalents. Pontoon – A hand made of an ace and a ten-point card. Same as a blackjack. Twist – This is the equivalent of hit. Stick – This is the equivalent of stand in blackjack. Buy – This is the equivalent double down in blackjack. Five Card Trick – A hand of 5 cards that is not bust. It beats all but pontoon. Dealer always twists on Soft 17. Similarly, the player must twist on hard 14, and can only stick on 15 or higher. Splitting is encouraged, though you can only split true pairs. You may re-split once for a total of 3 hands. You can buy on any two cards, and the buy bet is equal to your initial bet. You can buy after a Split. Interestingly, after you buy you can still twist. Dealer’s cards are both face-down, so there is no insurance option. You can not surrender. Dealer wins all ties. Your initial bet when playing Cryptologic Pontoon must be between 5 and 100 USD/GBP/Euro. You place your bet using the chips provided – these come in different denominations to help you bet just right. Pontoon and Five Card Trick wins pay at 2:1, and standard wins pay at 1:1. 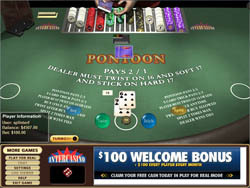 With its highly realistic 3D graphics, fully integrated animations, and 100% digital sound effects and music, Cryptologic Pontoon is as close as you will ever get to being in a casino while playing from home. The game is not without its bumps – the cards, for example, can be hard to read sometimes – but if you are looking for a fun, fresh Pontoon game that looks great, then you can certainly overlook those bumps and get on playing a super fun game of Pontoon – and hopefully winning too! If you get a 2, 3, or 4 in your first set of cards, it is usually good to buy, especially if your other card is low. This is because two low cards means you just have to get 3 more low cards to get a Five Card Trick. It also means you are far from 21, so you can afford to get a 10 point card or an Ace on top of your two initial cards. It’s not a totally safe bet, but no bets are, really. It’s just a good idea, and it usually pays in the end! Cryptologic’s version of Pontoon is one of the best we’ve seen, and it really delivers the fun in all ways imaginable. It looks fantastic with its fancy 3D graphics and animations, and plays pretty well too. Pontoon is rising in popularity every day, so don’t be the last to get in on the action. This is one of the top Pontoon games available, so spend some time in Free Play mode, figure out the flow of things, and start winning!